• Lock-Out Service: Service to unlock the vehicle if you are locked out. A remote unlock may be available if you have OnStar®. For security reasons, the driver must present identification before this service is given. 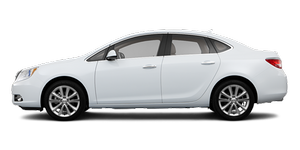 • Emergency Tow from a Public Road or Highway: Tow to the nearest Buick dealer for warranty service, or if the vehicle was in a crash and cannot be driven. Assistance is also given when the vehicle is stuck in sand, mud, or snow. • Flat Tire Change: Service to change a flat tire with the spare tire. The spare tire, if equipped, must be in good condition and properly inflated. It is the owner's responsibility for the repair or replacement of the tire if it is not covered by the warranty.